Today, I want to share one of my staple side salad recipes. This delicious and ridiculously simple Greek salad recipe is made very frequently in my house because it’s so flavorful, everyone loves it, and it goes with a huge variety of main courses. 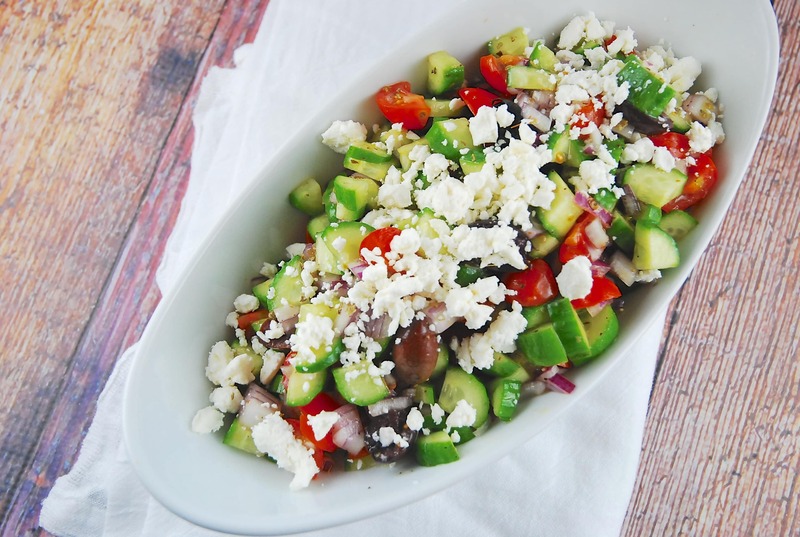 I love the wonderful combination of flavors and textures in this Weight Watchers Greek Salad – sweet, crunchy cucumbers, brine-y olives and the bold, lemony dressing, all topped off with creamy and salty feta crumbles. It’s a great low calorie salad recipe to add to your collection of staple Weight Watchers recipes that can be relied upon time and time again. A simple and basic Greek salad recipe is a must for everyone’s repertoire. This salad is simple, healthy, delicious, and it makes a great Weight Watchers salad recipe that goes great with many different meals. In a small bowl, whisk together the oil, lemon juice, oregano and salt and pepper. Add cucumbers, onions, tomatoes and olives together in a medium sized bowl. Pour dressing on top and toss well to combine. Why can’t I print recipes ?????? ?